MARLBORO, N.Y. ‘” A few songs into a jazz summit meeting at the Falcon here on Saturday night, the all-stars went through an unannounced lineup rotation. John Scofield had just started into his guitar solo on ‘Hacksensack,’ a Thelonious Monk tune, backed by the drummer Jack DeJohnette and the bassist Larry Grenadier. That was when the saxophonist Joe Lovano lumbered around the drum kit, grabbed a pair of sticks and took over, without breaking the chug-a-lug on a ride cymbal. Mr. DeJohnette sidled over to a piano to stab at some Monkish chords. The scene suggested the madcap grace and giddiness of a Marx Brothers routine. 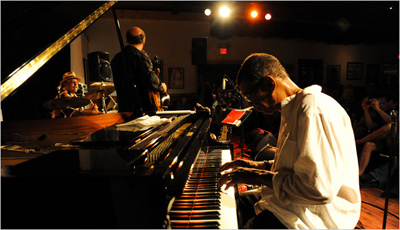 Mr. DeJohnette was leading this ad hoc quartet as part of his annual benefit for the Queens Galley, a nonprofit food outreach and soup kitchen in Kingston, N.Y. By design, all the musicians were residents of the Hudson Valley. (The same group will perform next month at the Culinary Institute of America, with proceeds going to the same place.) Their camaraderie was loose ‘” the instrument swap took place several more times ‘” but hardly nonchalant. They played for two hours and seemed reluctant to stop. Jack DeJohnette, John Scofield and Joe Lovano, from right, performed with Larry Grenadier (and swapped instruments a few times) at Falcon in Marlboro, N.Y. The concert was a benefit for the Queens Galley.